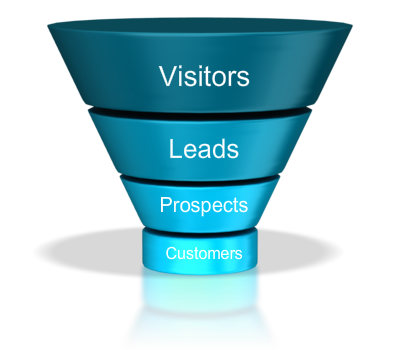 With a little forethought and planning, you can create an online sales lead funnel for your company to turn your website visitors into sales leads, and ultimately customers. The goal is to capture contact information to engage them in the sales process, and move them though the funnel. The first step? Create a dialog with search engines with well-written, compelling content written and optimized to attract seach engines. With all the emphasis on keywords and quality content, one thing remains constant. Content is still king, now more than ever. Google constantly adjusts its algorithms to reward quality content. Content development for the web requires quality content with just the right amount of keywords sprinkled throughout your website. Once you have identified the right keywords and search terms for your technology and products, weave them throughout your site in natural language to attract search engines. Most technology companies can achieve excellent search results with properly written and organized content. If your company’s technology is specific, it’s relatively easy to boost results with the right content, properly organized and optimized for search engines. For example, although acronyms can be useful to simplify product names, sometimes it’s better to write things out, depending on what people are searching for. If your products are sold online, lead them to a shopping cart. If your product is too expensive or complicated to sell online, send them to a simple online quote form along with other options to contact you. The goal is to make it easy to respond, in multiple ways, from anywhere on your site. Once you’ve captured the lead, the biggest part of the battle is won. Now you can develop a strategy to close the sale. Some prospects will buy immediately, but others may not be ready to buy. With a combination of email marketing, lead-scoring and direct sales, you can qualify and close prospects at the appropriate time. With your customers and prospects qualified in a database, develop content marketing strategies to keep selling by attracting, converting, closing and keeping the circle going, creating a steady stream of leads and sales from your website.